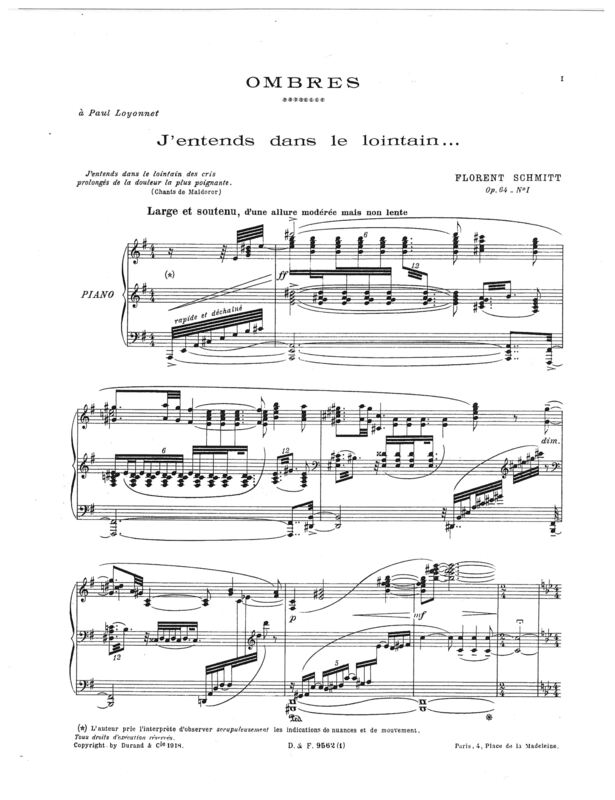 Maurice Ravel’s Gaspard de la nuit was the precursor to Florent Schmitt’s Ombres. 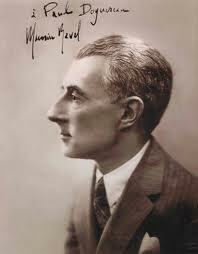 Maurice Ravel’s Gaspard de la nuit is justly recognized as that composer’s most towering achievement in piano keyboard writing. Composed in 1908, this set of three pieces (Ondine, Le Gibet, Scarbo) which take their inspiration from a book by Aloysius Bertrand, are the most technically demanding and revolutionary of Ravel’s piano works. 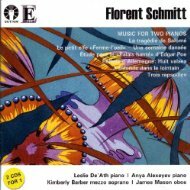 Far less well-known but equally impressive is a similar set of three piano pieces by Florent Schmitt, composed between 1912 and 1917. This suite is Ombres, Op. 64 (Shadows) — and likewise, many musicians regard it as Schmitt’s most complex, demanding work for solo piano. “This ambitious score shows Schmitt at the height of his impressionistic style, outdoing Debussy and even Ravel in the complexity of the texture, harmony and configuration. To produce such sounds, one would think that Florent Schmitt must have drawn inspiration from equally rich and fervent sources – and that turns out to be case in two of the movements. 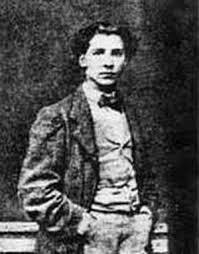 Comte de Lautréamont (Isidore-Lucien Ducasse), the Uruguayan-born French author, penned just two works before dying at the age of 24 during the Prussian siege of Paris (1870). The first piece in the set is titled “J’entends dans le lointain …” and draws inspiration from a passage from Comte de Lautréamont’s 1869 violent, nihilistic novel Les Chants de Maldoror (“I hear in the distance drawn-out cries of the most poignant grief.”). The French musicologist Marc Vignal characterizes this movement as “a very audacious piece,” noting that the musical notation is on three staves throughout. Schmitt titled the third piece in his set “Cette ombre, mon image …” and the score bears an epigraph from Walt Whitman (“That shadow, my likeness, that goes to and fro.”). Although less complex than the first movement, it too is written mainly on three staves. Sandwiched in between is a shorter movement titled “Mauresque.” This piece was composed the earliest of the three and does not have any direct literary connection that we know of. It is a highly representative example of Schmitt’s “orientalist” writing, and listeners will recognize the second theme as one the composer interpolated into the first suite of Antoine et Cléopâtre which he composed nearly a decade later. Visual and aural attraction: Much of Florent Schmitt’s score for Ombres is written on three staves. Unlike Ravel, who dedicated each movement of his Gaspard de la nuit to pianist friends (Harold Bauer, Jean Marnold and Rudolph Ganz), Schmitt dedicated each movement of Ombes to literary or social acquaintances: lecturer/writer Paul Loyonnet; Linette Chalupt, daughter of the poet René Chalupt; and Yvonne Müller, soon to become the wife of Italian composer Alfredo Casella. This may explain partially why Ravel’s composition is better known, as its dedicatees made the suite part of their recital programs. For those who may think that Florent Schmitt’s compositional talents weren’t cutting edge for his time, they need to listen to Ombres! Speaking personally, I find this music to be every bit as forward-looking as Leslie De’Ath claims it to be. First recording: Werner Bartschi (1982). Fortunately for us, it’s easy to hear the music because there are three recordings currently available. To my knowledge, pianist Werner Bärtschi made the world premiere recording in 1982 (on the ACCORD label). His strong, vital interpretation made a tremendous impression on me then … and it still does today. More recently, the French pianist Vincent Larderet recorded the set for NAXOS in 2009. Mr. Larderet’s interpretation is more broadly expansive — particularly in the outer movements. It is every bit as legitimate as Mr. Bärtschi’s approach to the music, and for this reason both recordings are well-worth hearing. Thanks to this clip uploaded to YouTube, you can hear Vincent Larderet’s interpretation of Ombes while actually following along with the score — a feast for the eyes as well as for the ears! A third recording, made by pianist Laurent Wagschal on the Saphir label in 2010, is another fine interpretation that has now been reissued by Timpani, a label that has devoted considerable energy to offering numerous orchestral and instrumental recordings of Florent Schmitt to the public. Perhaps because of its musical “heft,” the first movement of Ombres was treated to additional arrangements by Schmitt. The composer created a version for piano and orchestra that was premiered in 1930 by the pianist Jacques Février, with conductor/composer Gabriel Pierné directing the Colonne Concerts Orchestra. Unfortunately, we have no recorded performance of what must be an incredible piece of music in this arrangement, but we do have a two-piano version that was recorded in 2011 by the duo-piano team of Leslie De’Ath and Anya Alexeyev (on the Dutton Epoch label). Listening to that recording makes it clear that this is music that fairly cries out for orchestral treatment. Here’s hoping that an enterprising pianist, conductor and orchestra will explore Schmitt’s piano-and-orchestra score to J’entends dans le lointain … and bring it to life. 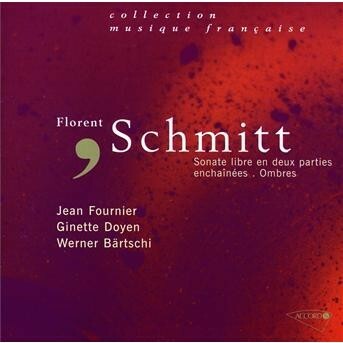 Update: 9/3/15: Florent Schmitt’s arrangement of J’entends dans le lointain … for piano and orchestra has finally received its world premiere recording on the ARS Produktion label. 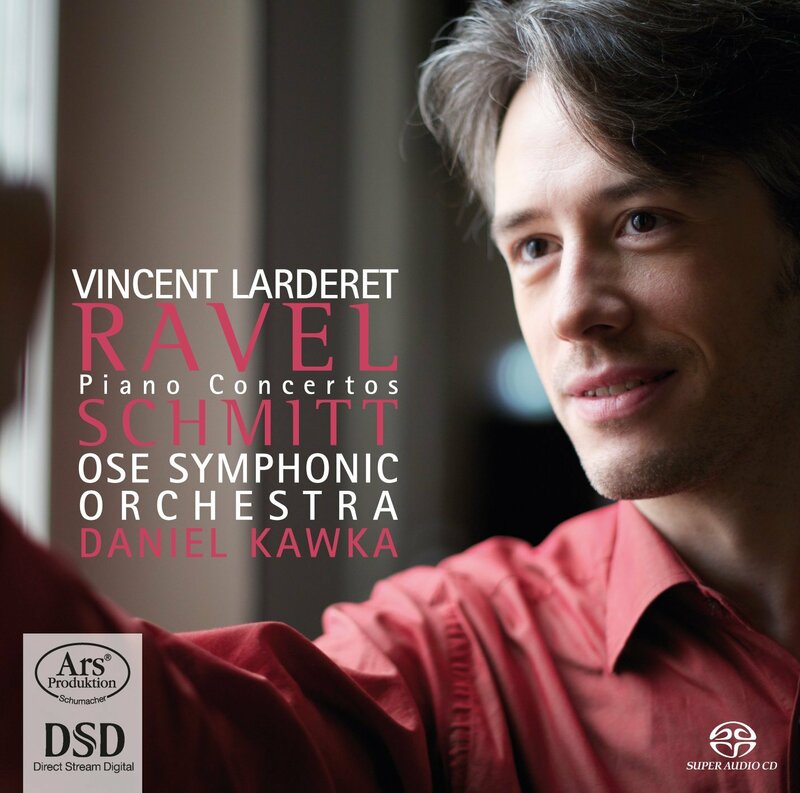 The French pianist Vincent Larderet, who had already recorded the complete Ombres piano suite for NAXOS, is featured in the new recording, joined by Daniel Kawka conducting the OSE Orchestra. I’ve heard the new recording — and I can report it is absolutely stunning. This entry was posted in Classical Music, Composers, French Composers, Piano Music and tagged Aloysius Bertrand, Classical Music, Daniel Kawka, Florent Schmitt, French Composers, Gabriel Pierne, Gaspard de la nuit, Jacques Fevrier, Laurent Wagschal, Lautreamont, Leslie De'Ath, Loyonnet, Marc Vignal, Nones, Ombres, OSE Orchestra, Ravel, Vincent Larderet, Walt Whitman, Werner Bartschi. Bookmark the permalink. Giuseppe Verdi and the nexus of music and politics: An interview with author Alberto Nones.